Do super PACs take PayPal? NEW YORK (CNNMoney) -- Silicon Valley renaissance man Peter Thiel donated another $1.7 million in January to a super PAC that backs Ron Paul, according to disclosure documents filed Monday. The donations, disclosed in Federal Election Commission filings, account for almost 75% of the $2.3 million collected by the Endorse Liberty super PAC last month. They aren't the first donations from the entrepreneur, venture capitalist and hedge fund manager. Thiel made donations of $150,000 and $750,000 to the super PAC in December, gifts that were disclosed in the committee's year-end filing. Thiel's $2.6 million in total donations account for 76% of the super PAC's fundraising since it came online late last year, underscoring the ability of deep-pocketed donors to have a major impact on campaign spending. The donations are just a tiny fraction of the libertarian activist's net worth. In addition to his success at PayPal, which is now owned by eBay (EBAY, Fortune 500), Thiel has made a few other choice business moves. In 2004, the angel investor put up $500,000 for Facebook's first financing round. 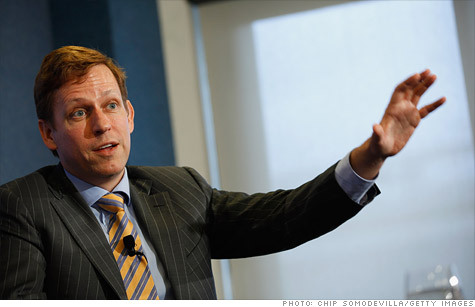 At $30 per share, his stake in the social-networking powerhouse is now worth $1.3 billion. That means $2.6 million in donations are no big deal -- only 0.2% of his Facebook holdings alone. That would be like a millionaire giving $2,000. Or a $200 donation for someone worth $100,000. Super PACs are new this election cycle, and they have quickly become the donation method preferred by wealthy donors looking to make a splash. More than half of itemized super PAC money this cycle has come from just 37 people, according to an analysis conducted prior to Monday's filings by PIRG and Demos, two research groups.